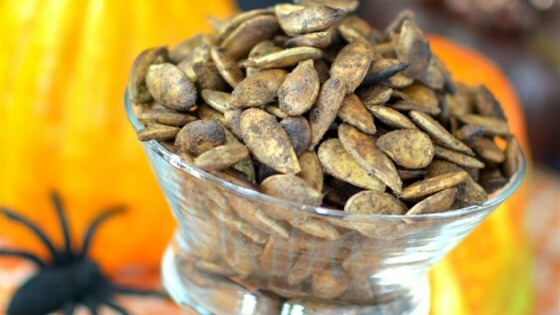 "Spicy, smoky, and salty pumpkin seeds that are just a little different from your normal recipe--but still just as easy!" Place the pumpkin seeds in a container with a lid, and mix in the Worcestershire sauce, hot pepper sauce, bacon grease, and liquid smoke flavoring. Cover the container, and allow to stand overnight. Preheat the oven's broiler, and set the oven rack about 6 inches from the heat source. Remove the seeds from the flavorings with a slotted spoon, and transfer into a bowl. Mix the cayenne pepper and garlic salt into the seeds, and stir to coat well. Spread the seeds over a baking sheet in a single layer. Sprinkle with additional salt. Roast the seeds under the broiler until toasted and golden brown, about 8 minutes; turn the seeds over twice during broiling. Cool to room temperature. Soaking overnight is optional but helps the seeds soak in the flavor. The liquid smoke and bacon grease make this treat especially delish! Way too much stuff for pumpkin seeds. Not a good flavor combo in my opinion. Just enough spice to warm the cauldrons of your soul and keep the goblins away but not enough to scare away the ghost in you. Smoky, spicy goodness.